Numerous infectious agents are pathogenic for the pig intestine. As we know, intestinal diseases affect pigs during all the production phases, from neonatal piglets to finishing pigs. The small intestine is largely responsible for nutrient digestion and absorption in the gastrointestinal tracts of pigs. Hence, the small intestine is one of the most important organs for the conversion of feed into meat. This area of the intestine is composed of an extensive mucosal surface, with increased cell turnover as well as high absorptive and secretory capacities. It is also, unfortunately, an ideal location for the colonization of enteric pathogens, which impair the digestive process and often cause diarrhea or inflammation, compromising weight gain. Investigations into the pathogenesis of infectious intestinal diseases are, therefore, of special interest not only for researchers, but also for veterinarians and producers. Numerous infectious agents are pathogenic for the pig intestine. As we know, intestinal diseases affect pigs during all the production phases, from neonatal piglets (porcine epidemic diarrhea virus, E. coli, Clostridium spp., etc.) to finishing pigs (swine dysentery, ileitis, salmonellosis, etc.). Fortunately, many advances in understanding the pathogenesis of enteric diseases have occurred over the years due to the use of pig trials and in vitro experiments. Pig trials can be used to investigate the mechanisms used by both the infectious agents to invade the host, and by the host itself to respond to the infection. Although extremely valuable for some purposes, the use of animals to study the intrinsic pathways involved in the disease process is not only expensive and time demanding, but also of ethical concern. In vivo studies present some disadvantages, mainly the presence of confounding factors such as an uncontrolled environment, microbiome modulation, immune responses and individual variation, which may mask the mechanisms of pathogenesis when the purpose of the experiment is to understand the primary relationships between host and pathogen. To overcome these issues, in vitro studies offer some advantages. The in vitro investigations of host-pathogen interactions generally take place in the laboratory. Cell cultures, usually composed of a single cell type, are grown in a monolayer, i.e., in a two-dimensional structure for use in these studies. Most of the knowledge with regards to the behavior of enteric pathogens has been achieved using these cell cultures. Although the simplistic model of these 2-D cells may facilitate the execution and interpretation of the experimental outcomes, the model fails to show relationships between diverse cell types and the morphological structures of the small intestine. To overcome the limitations of 2-D cell cultures, enteroids have been developed in the past few years and are a very promising in vitro model for studying host pathogen interactions in the small intestine. Enteroids are three-dimensional structures that originated from embryonic stem cells, induced pluripotent cells or adult stem cells from intestinal tissue. In addition to a 3-D structure, enteroids have the ability to self-renew, self-organize and function as the tissue of origin, which are distinct advantages over the traditional 2-D cell cultures. Enteroids, also known as “mini guts,” possess lumen, crypt and villi domains, and thus are very similar morphologically to the small intestine. Also like the small intestine, the enteroid epithelial layer is composed of not only enterocytes, but also of enteroendocrine cells, goblet cells, tuft cells, Paneth cells and stem cells (Figure 1)[1,4]. This complex structure offers ideal conditions to investigate the mechanisms used by bacteria, viruses, protozoans and other enteric pathogens to colonize the intestinal epithelium, which affect the epithelial function and result in disastrous consequences for the digestive process. Figure 1: Advantages and disadvantages of models to investigate pathogenesis of pig enteric pathogens. In addition to providing a close resemblance to the intestine, which allows a broad area of research, the use of enteroids also reduces the number of animals required for research. A single intestine donor is enough to obtain numerous enteroids which, once developed, can be passaged, multiplied and maintained for several months in the laboratory. This eliminates the need for a new preparation and euthanasia of another animal. Enteroids are, therefore, an ideal in vitro model for the intestine, reducing costs and ethical debates associated with animal trials, while simultaneously offering a controlled environment that allows reliable interpretation of the outcomes by diminishing the confounding factors found in vivo (Figure 1). Obtaining and maintaining enteroids in the laboratory requires some expertise. Briefly, a small piece of intestine (about 3 centimeters) is physically disrupted to obtain the crypt portion of the intestinal epithelium, where the stem cells reside (Figure 2). 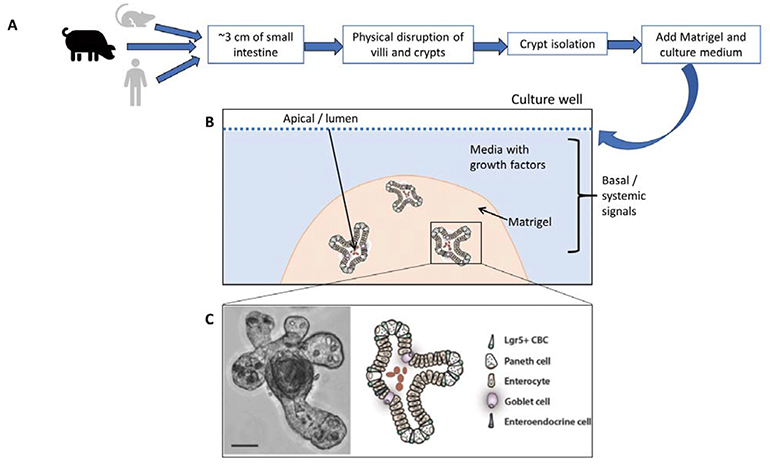 The isolated crypts are then plated into an extracellular matrix (Matrigel) that resembles the intestinal basal lamina and sustains the 3-D growth of the enteroids. The Matrigel is then covered with a special medium that contains growth factors and substances that induce the differentiation of the newly divided cells (transit amplifying cells) into their completely differentiated status (goblet cells, enteroendocrine cell and enterocytes) (Figure 2). Similar to the intestine, the cells in the enteroids divide in the crypt and move toward the villus where, within two to three days of culture, they are exfoliated into the lumen. Figure 2: Culture of enteroids. A) Enteroids can be obtained from a piece of small intestine from a pig, mouse or biopsy sample from a human. B) The crypts isolated from the small intestine are plated in Matrigel, which is then covered with a special culture medium. The stem cells present in the isolated crypts will grow and, in a few days, a three-dimensional structure containing an epithelial layer and lumen can be recognized. C) Schematic of enteroids. On the left is a phase contrast image of a developing mouse enteroid, and on the right the figure shows that all epithelial cell types that are observed in the small intestine are also present in enteroids. Nonetheless, enteroids have not yet been routinely used as models for the pig enteric pathogens. A current research focus has been testing enteroids as in vitro models for ileitis (proliferative enteropathy) in pigs. This research is being done as a collaboration between Connie Gebhart’s (expert on ileitis) and Milena Saqui-Salces’ (expert on intestines) research laboratories. Ileitis, with the official name of proliferative enteropathy, is an enteric disease characterized by poor performance in affected pigs, with or without clinical signs of diarrhea. The hallmark lesion of the disease in pigs and other animals is proliferation of the cells of the small intestine. Ileitis is recognized in most countries where pig production is relevant, such as the United States, Canada, China, Brazil, Australia and many European Union countries. ■ Proliferative hemorrhagic enteropathy, which occurs sporadically, affects finishing and breeding pigs, and can cause bloody diarrhea and sudden death. ■ Porcine intestinal adenomatosis, which is observed more frequently in growing pigs, presents a milder, non-pathognomonic diarrhea. ■ Subclinical ileitis, in which diarrhea is not a feature but affected pigs have compromised weight gain. In all the three forms of ileitis, the thickening of the intestine is observed, often in the ileum in the small intestine. This thickening is characterized microscopically as an increased number of epithelial cells in the infected crypts, and a decreased number of goblet cells. Interestingly, non-infected crypts, even adjacent to the affected ones, do not show any signs of hyperplasia. How Lawsonia intracellularis, the pathogen that causes ileitis, induces this increase in the intestinal epithelial cells remains a mystery. Lawsonia is an obligate intracellular bacterium, which means that, similar to a virus, Lawsonia requires cells in a pig or cell culture in the laboratory to grow. Lawsonia also requires a special microaerophilic atmosphere to be grown in vitro. These characteristics make it difficult both to isolate Lawsonia from infected intestines and to propagate it in vitro. These are also some of the reasons why there are few studies on Lawsonia antimicrobial susceptibility or use of antimicrobial alternatives to control the disease. These unique Lawsonia characteristics also complicate our ability to understand the mechanisms involved in the thickening of the intestinal epithelium seen in infected animals. To date, in vitro studies aiming to investigate the issues described above have relied on the traditional 2-D cell cultures, and have been limited to a few laboratories around the world. These studies have also failed to reproduce the cellular proliferation observed in intestines affected by ileitis. This scenario is, therefore, an ideal situation for the application of enteroids as a model for the study of ileitis pathogenesis. Enteroids obtained from mice have been used as our primary enteroid model to establish the infection and cultivation protocols with Lawsonia. After obtaining the intestinal crypts and growing them for a few weeks, the enteroids were microinjected with Lawsonia organisms into the enteroid lumen. After incubation with the special atmosphere required by Lawsonia, the enteroids were harvested and prepared for analysis of the infection. Using immunofluorescence, Lawsonia organisms were detected in the enteroid epithelial cells (Figure 3), which supports the feasibility of the model for our purpose of investigating the pathogenesis of ileitis. This is an ongoing research project that requires expertise both in Lawsonia cultivation and in enteroid manipulation, and may represent the most reliable model we have so far to investigate the bacterial mechanisms and the epithelial response involved in the colonization and lesions observed in ileitis. Figure 3: Schematic of enteroid microinjection with Lawsonia intracellularis. Using an inverted microscope, the lumen of the enteroid is localized and then injected with a suspension of Lawsonia. Lawsonia organisms (green) were observed in enteroid epithelial cells (nuclei are stained blue) seven days post infection by immunofluorescence. Enteroids represent a promising model to study the intestinal response to infections, to investigate effects of diet composition on intestinal epithelial physiology, and to understand the mechanisms used by enteric agents to cause disease. This last use is of special interest for investigating pig enteric diseases, which are responsible for rising costs to the swine industry. Further, limitations in antimicrobial use to control enteric diseases in pigs will require us to find efficacious antimicrobial alternatives; and these alternatives may be tested using enteroids as an in vitro model of ileitis. 1. Clevers H. “Modeling development and disease with organoids.” Vol. 165, Cell. 2016. 2. Karve S.S.; S. Pradhan; D.V. Ward; A.A. Weiss. “Intestinal organoids model human responses to infection by commensal and Shiga toxin producing Escherichia coli.” PLoS One. 2017;12:1–20. 3. Pampaloni F.; E.G. Reynaud; E.H.K. Stelzer. “The third dimension bridges the gap between cell culture and live tissue.” Nat Rev Mol Cell Biol. 2007;8:839–845. 4. Sato T.; H. Clevers; et al. “Growing self-organizing mini-guts from a single intestinal stem cell: Mechanism and applications.” Science (80- ). 2013;340:241–260. 5. Saxena K.; S.E. Blutt; K. Ettayebi; et al. “Human intestinal enteroids: A new model to study human rotavirus infection, host restriction, and pathophysiology.” J Virol. 2016;90:43–56. 6. Vannucci F.A. ; C.J. Gebhart. “Recent advances in understanding the pathogenesis of Lawsonia intracellularis infections.” Vet Pathol. 2014;51:465–477. 7. Wilson S.; A. Tocchi; M. Holly; W. Parks; J. Smith. “A small intestinal organoid model of non-invasive enteric pathogen-epithelial cell interactions.” Mucosal Immunol. 2014;8. 8. Zhang X.; A. Gong; Y. Wang; et al. “Cryptosporidium parvum infection attenuates the ex vivo propagation of murine intestinal enteroids.” Physiol Rep. 2016.